This page highlights the latest news on my adventures in the textile arts. For a listing of Exhibits/Shows my work has been shown in please see the page Exhibits, Shows and More. Please see my post Solo Show Seattle Municipal Tower, Part II for more details. My first solo show will feature 12 of my art quilts made from recycled materials and opens April 18, 2019 at the Seattle Municipal Tower in Downtown Seattle, Washington. One of my early recycled silk art quilts, Color Study I: Flying Triangles, was juried into the national Art Show – “Soulful: A National Exhibition of African American Artists”. It opens February 7th and runs through February 28th at the d’Art Center in Norfolk, VA. The book for the WCQN show, Visioning Human Rights in the New Millennium: Quilting the World’s Conscience will be released on February 28, 2019. My quilt, The Lesson & The Equation will be one of the quilts featured in this book for the exhibit. My secret dream, to show a piece of my art at a New York City gallery has been realized. My piece, Seeds (2017) a banner from the 2017 Women’s March, inspired by a Mexican proverb, is showing as part of the exhibit Still They Persist from the FemFour at the LMAKgallery on the Lower East Side in Manhattan, New York City from October 17, 2018 – November 3, 2018. See the post “Seeds” and My Secret Dream for more details. My piece, The Lesson and The Equation is featured on the website of the Brussels, Belgium based organization Human Rights 70. For more information, please see my post International Exposure for The Lesson and The Equation. The Lesson & The Equation debuts at its first WCQN show on Friday August 17, 2018. To read the related post, please see Visioning Human Rights in the New Millennium, Part 1. The Lesson and the Equation (2016) by Tierney Davis Hogan. Image courtesy of Dr. Carolyn Mazloomi. The show opens August 17, 2018 at the Filton Center for Creative Arts in Hamilton, Ohio. The show is based on the United Nations (U.N.) Universal Declaration of Human Rights. Show participants had to select one of the thirty (30) Articles in this declaration and make a 50″ x 50″ quilt inspired by the Article. 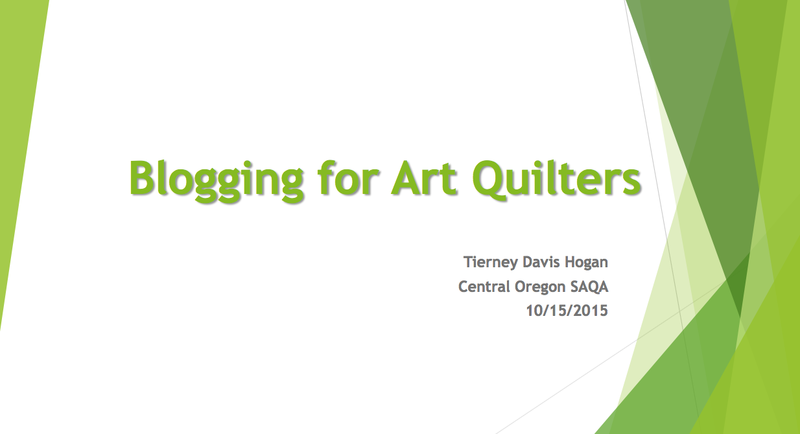 On April 19, 2018 I was the featured speaker at our monthly Central Oregon SAQA (art quilting) group meeting. I did a presentation on the Women of Color Quilting Network (WCQN) and the 2017 Quilters Take Manhattan (QTM) event I attended in NYC in September 2017. Please see the post Speaking Engagement for more information. Ethnic Artist Roster, Seattle Office of Arts & Culture – in November 2017 I was juried by the City of Seattle’s Office of Arts & Culture panel to be listed on their Ethnic Artist Roster. Pathways, Central Oregon SAQA exhibit at Twigs Gallery, Sisters, Oregon, opening October 27, 2017, running through November 2017. Pathways, Central Oregon SAQA exhibit at Cascade Sotheby’s International Realty Gallery, downtown Bend, Oregon, opening September 3, 2017 and running through October 3, 2017. Sisters Outdoor Quilt Show, Special Exhibit, July 8, 2017. My art quilt Abandoned Water Structure is showing 04/05 – 07/03/17 at the Seattle Municipal Tower Gallery, Seattle, WA, as part of the Your Body of Water, Part II exhibit by the City of Seattle’s Office of Arts & Culture. UPDATE: See the post “Ohio Shifted” Returns from Road Trip to PIQF for an update. Creative Quilt Challenges is a Special Exhibit at the Pacific International Quilt Festival (PIQF) , October 13-16, in Santa Clara, California. Shape Shifting will be an exhibit within their Creative Challenges exhibit. Please see the post Creative Quilt Challenges: Shape Shifting for more information about the creation of this piece. Our Central Oregon SAQA (Studio Art Quilt Associates) group is showing our Doors exhibit at Cascade Sotheby’s International Realty Gallery. My piece, Recycled Doors (2016), is in this show which opened during the First Friday Art Walk on 09/02/2015 and will run through September. This show first opened at the 2016 Sisters Outdoor Quilt Show as a special exhibit (see the post 2016 Sisters Outdoor Quilt Show Part II for more of the story on this exhibit and for photos of most the innovative art quilts in this show inspired by the concept of a “door”). Please see the post Seattle Public Utilities’ Portable Works Collection for more details. Recycled Door (2016) will debut at the 2016 Sisters Outdoor Quilt Show on Saturday July 9, 2016. It will be part of the Central Oregon SAQA Exhibit – Doors. Recycled Door (2016). Designed and pieced by Tierney Davis Hogan. Quilted by Guadalupe Designs. Photo credit: Marion Shimoda. Betty Anne Guadalupe and I are part of the Summer Members’ Show opening at the Mott Gallery in Richmond, VA that opens June 4, 2016 and runs through June 19, 2016. We will be showing 6 pieces from our The Wardrobe Meets the Wall Collection. Please see the post Upcoming Show: Mott Gallery for additional details. Note: Of course I spent up to the last minute sewing labels on the back of the art silk quilts before shipping them across the country to VA in time for the show. For a listing of the pieces shown, please see the post on The Wardrobe Meets the Wall blog page: Mott Gallery Show Opening. Our show The Collaboration opened at Twigs Gallery Friday March 25 and will run through April 2016. I had 4 pieces in the show. We appreciate all who came out for the show opening – current art quilting friends and people from the community attending the 4th Friday Art Quilt Walk in Sisters, Oregon. I was selected to be featured in the SAQA (Studio Art Quilt Associates) Winter 2015 Edition of Fiber Art Now a quarterly magazine for contemporary fiber arts and textiles. The ad is on page 30 of the Winter 2015, Vol. 5., Issue 2 edition of Fiber Art Now. To read the whole story behind this ad, please see the post Good, but Embarrassing News. My collaborative piece, Archeological Dig: The Vessel, debuted in its first show at the QuiltWorks Gallery’s “November Inspirations: Small Quilt Show” which opened during the November First Friday Art Walk on 11/6/2015 and will be on display through the month of November. I designed and pieced this art quilt using recycled silk garment manufacturing samples set in a tonal variegated burnt orange cotton background. My collaborative partner on The Wardrobe Meets the Wall, Betty Anne Guadalupe, creatively quilted the piece to give the background strong dimension and depth. Originally the piece was titled: “Floating Vessel”, but I was inspired by a comment from a friend that the piece looked like “something found during an archeological dig”. Inspired by the thought of the quilt representing something ancient that was unearthed, and I renamed the piece “Archeological Dig: The Vessel”. If you would like to read some of the highlights of presentation, please see my post Blogging for Quilters. I began entering art shows last year as part of my journey to someday (hopefully) become a professional artist. The juried shows (in order to be accepted into the show your piece is reviewed by a jury of experts and “juried in” or declined) I entered have been through the SAQA (Studio Art Quilt Associates) Calls for Entries into shows. I have never entered a local juried show, until now. Deschutes Public Library has an annual community read called A Novel Idea (all of Central Oregon is encouraged to read the same book and then the book’s author speaks at the annual Novel Idea book event). This year’s book was A Tale for the Time Being by Ruth Ozeki. As part of the annual Novel Idea celebration, an art show is held at the library for art inspired by the book. On a whim I entered this local art show and my piece Jiro’s Robe was juried in. 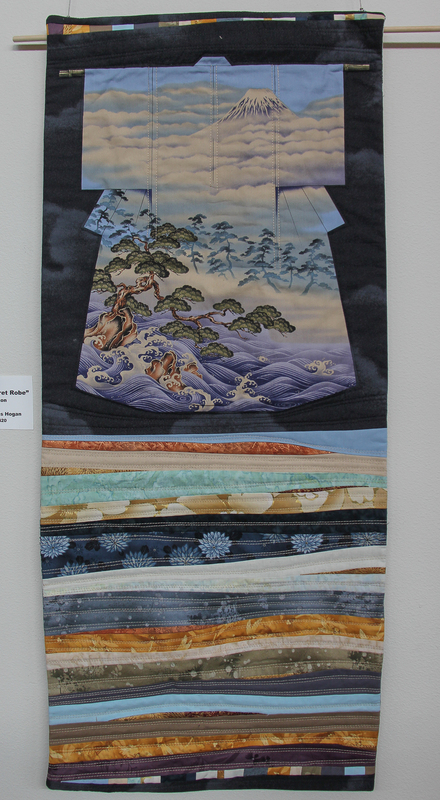 Jiko’s Robe is the only textile art in the downtown library show, the rest of the pieces are paintings. Jiko’s Secret Robe (2015). Pre-printed kimono panel with piecing by Tierney Davis Hogan. Quilted by T. Hogan. Jiro’s Robe will be shown at the Downtown Branch of the Deschutes Public Library March to early June 2015. Color Change (2012), another quilt from The Wardrobe Meets the Wall collection a collaboration between Betty Anne Guadalupe of Guadalupe Designs, and myself, was accepted into the Pacific International Quilt Festival. 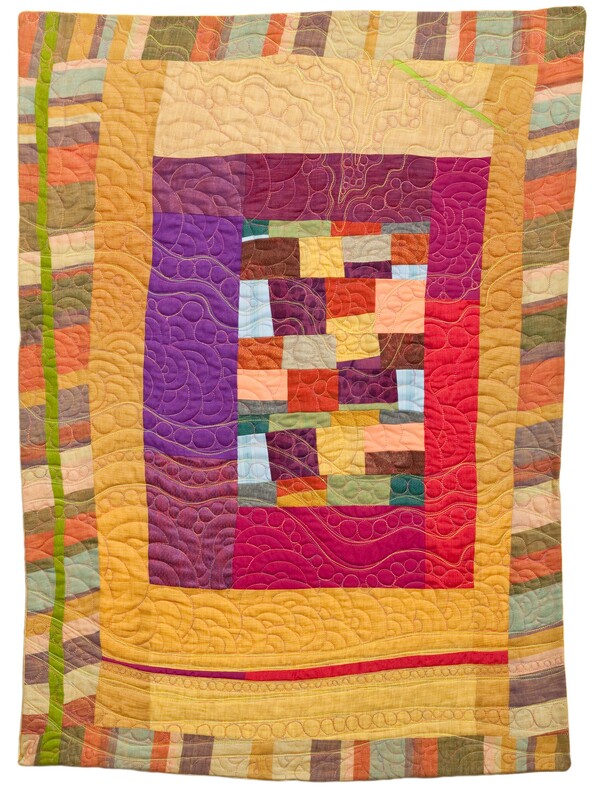 The Pacific International Quilt Festival (PIQF) will be held October 16 – 19, 2014 at the Santa Clara Convention Center in the greater San Francisco Bay Area. 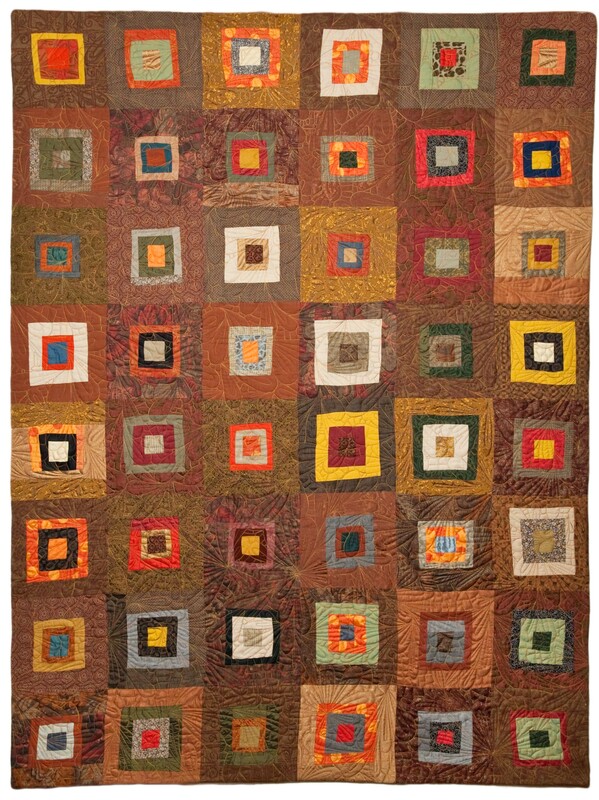 According to the show’s website the show contains a ” collection of over 800 quilts and works of wearable and textile art” and is the largest quilt show on the West Coast. Color Change (2012). Designed & pieced by Tierney Hogan. Quilted by Guadalupe Designs. Photograph by Jeremy Koons. Random not so Random (2012) was selected to be shown at NEW DIRECTIONS ’14, Barrett Art Center’s 29th Annual National Juried Contemporary Art Exhibition. The New Directions ’14 exhibit will be on display from Saturday, September 27, 2014 through Saturday, November 8, 2014 in the historic Barrett Art Gallery 1850’s townhouse, located at 55 Noxon Street, Poughkeepsie, New York. As exciting as the notification that one of my silk art quilts will be in a juried show, was with information about the distinguished juror for New Directions ’14 who selected the piece: Lynne Warren, Curator, Museum of Contemporary Art Chicago, Chicago, IL. “Random not so Random” was selected as one of 82 works by 74 artists from a total of 653 eligible entries from 202 artists nationwide. I shared news of getting into this show with an artist/painter friend in NY and he said: “Of the few places to show throughout NY outside of NYC, the Barrett Art Center is pretty prestigious, and to be selected by a juror with such an illustrious affiliation: you should be walking on air.” I am walking on air! I received some wonderful news – images from five of my quilts are going to be in a new art/quilting book: 1000 Quilting Inspirations by Sandra Sider. It will be published by Quarry Books and is due for publication mid Dec 2014 or early January 2015. The book is already listed on the Quarry Books website and you can view it from this link 1000 Quilt Inspirations. Please see my post Look Look I am in a Book for more details. In 2012 a group of art quilters came together and created the Quilting Meets Couture Collection which was exhibited in several venues to include the 2013 Sisters Outdoor Quilt Show. This collection of 21 art quilts were created from silk, wool and linens samples and remnants from couture fabrics from the European textile houses of Ratti, Braghenti, Castellini and D’Este. The fabrics in these quilts are from the NYC Fashion District in 1990s, where Claire Spector was gifted by staff of one of the textile houses couture fabric samples and remnants. Below are my four (4) art quilts that were part of this collection. Flying Triangles (2012). Photographed by Jeremy Koons. Color Change (2012). Photographed by Jeremy Koons. Random Not So Random (2012). Photographed by Jeremy Koons. Silk Landscape (2012). Photographed by Jeremy Koons. WOW!!!! Your crafting is so awesome. What fabulous quilting! Your mom must be proud! I am! I am positive she is gleaming with pride!